Brandon Peters replaced fifth-year senior John O'Korn against Rutgers and made the most of the chance to play. ANN ARBOR, Mich. (AP) — Quarterback Brandon Peters flourished in his first extended chance to play for Michigan. It might have earned him another chance to show what he can do. Harbaugh said there’s a “51 percent,” chance Peters will make his first start for the Wolverines (6-2, 3-2 Big Ten) against the Golden Gophers (4-4, 1-4) on Saturday night. 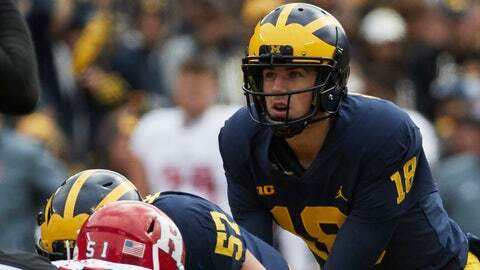 And perhaps to keep the opponent guessing, Harbaugh said both the redshirt freshman and fifth-year senior John O’Korn would be prepared to play. “When he first got here, we could barely hear his cadence,” senior center Patrick Kugler recalled. “The biggest step I’ve made is my communication,” he said Saturday. “He was very calm and collected,” Kugler said. “It changes the whole offense when you have the ability to do both,” Kugler said. “Brandon came in and did a phenomenal job. He’s not playing quiet anymore. He’s confident in his play and you need that in a quarterback.